A new renewable natural gas industry could take shape, even in the face of plentiful, inexpensive fossil-based natural gas, according to a new report from Kachan & Co. 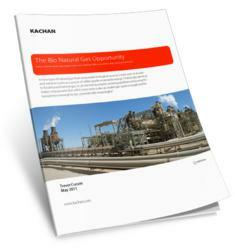 The Bio Natural Gas Opportunity by Kachan & Co. It's the holy grail of biogas: an inexpensive, pipeline-ready bio natural gas chemically similar to natural gas, yet made from plentiful, renewable feedstocks—and transportable in today’s infrastructure alongside fossil-based natural gas. Bio natural gas, a new type of pipeline-injectable natural gas created from biological sources, could eventually give utilities a way to generate renewable power 24/7 and meet government renewable energy mandates, complementing today’s solar and wind farms. That’s one of the surprising findings from a new report titled The Bio Natural Gas Opportunity, which identifies early leaders and emerging commercial opportunities in bio natural gas today and tomorrow. The report was authored by cleantech research and consulting firm Kachan & Co.
Bio natural gas (BNG) is chemically similar to fossil-based natural gas, but derived from biological materials. Unlike raw biogas or syngas, BNG can be combusted in any system built for fossil fuel natural gas, injected into natural gas pipelines for transportation and compressed in LNG/CNG forms for transportation fuels. As a fungible commodity, pipeline-injectable BNG would enable utility and corporate customers to effectively buy renewable energy from any point on the widely deployed natural gas pipeline system. FortisBC, a gas, electricity and alternative energy solutions provider in British Columbia, Canada, is already playing a key role by injecting BNG into its existing natural gas distribution system to begin to offer customers renewable natural gas options. “As one of the first utility companies in Canada to include alternative energy solutions as part of its regulated energy offerings, providing customers with BNG makes good sense and is a natural extension of the piped energy services we've delivered for over a century,” said Doug Stout, vice president, energy solutions and external relations, FortisBC. California utilities Pacific Gas and Electric Company (PG&E) and Southern California Gas Company, interviewed extensively for the Kachan study, are also active supporters of anaerobic digestion projects today and are following bio natural gas developments closely. With new shale gas reservoirs and hydraulic fracturing (“fracking”), fossil-based natural gas has become plentiful and inexpensive. Yet, even though BNG may be several times more expensive to produce than fossil natural gas today, over the long term the report indicates it could emerge as disruptive for utility-scale renewable power once its operational flexibility, renewable credit and carbon offset value is more fully realized. Advantages of bio natural gas, as determined in the report, include its characterization as a low cost, versatile form of renewable energy; its design for use in existing transmission pipelines, turbines and boilers; the wide availability of feedstocks; applicable subsidies and favorable carbon lifetime assessment. Among the drawbacks cited and explored by the report include technology de-risking, timeline to commercial viability, other land-use needs affecting feedstock availability, and other biofuel solutions that might muddy the waters and could de-position BNG. The report examines BNG’s applicability in multiple markets, profiles 16 technology vendors at the forefront of the industry and makes recommendations for investors, entrepreneurs, utilities & large corporations, natural gas companies, regulators and government agencies and others. The report’s author is Trevor Curwin, cleantech contributor for CNBC.com, and environmental reporter for tech blog DVICE.com. He also writes for other media outlets, including The Examiner newspapers, Earth2Tech.com, Environmental Finance, and Sustainable Industries. As a consultant, Trevor has focused especially on utility-scale renewables. Prior to this, he worked on strategic marketing and capital formation in alternative assets for Bank of America. Kachan & Co.’s The Bio Natural Gas Opportunity was produced in participation with FortisBC, and is available from $1,895 for a single user license at http://www.kachan.com/research/bng-bio-natural-gas-report. Kachan & Co. is a cleantech research and advisory firm with offices in San Francisco, Toronto and Vancouver. The company publishes research on clean technology companies and trends, offers consulting services to large corporations and cleantech vendors, and connects cleantech companies with investors through its Hello Cleantech(tm) and [Northern Cleantech Showcase(tm) programs. Kachan staff have been covering, publishing about and helping propel clean technology since 2006. FortisBC is an integrated energy solutions provider focused on providing safe and reliable energy, including natural gas, electricity, propane and alternative energy solutions, at the lowest reasonable cost. FortisBC employs more than 2,000 British Columbians and serves approximately 1.1 million customers in more than 135 B.C. communities. FortisBC is indirectly wholly owned by Fortis Inc., the largest investor-owned distribution utility in Canada. FortisBC owns and operates four regulated hydroelectric generating plants, approximately 7,000 kilometres of transmission and distribution power lines and approximately 46,000 kilometres of natural gas transmission and distribution pipelines. FortisBC Inc., FortisBC Energy Inc., FortisBC Energy (Vancouver Island) Inc., and FortisBC Energy (Whistler) Inc. do business as FortisBC. Fortis Inc. shares are listed on the Toronto Stock Exchange and trade under the symbol FTS. Additional information can be accessed at http://www.fortisinc.com or http://www.sedar.com. Megan Amaral, Associate, Kachan & Co.